Arvanitika ﻿/ˌ﻿ɑrvəˈnɪtɨkə﻿﻿/ (Arvanitika: αρbε̰ρίσ̈τ arbërisht; Greek: αρβανίτικα), also known as Arvanitic, is the variety of Albanian traditionally spoken by the Arvanites, a population group in Greece. Arvanitika is today an endangered language, as its speakers have been shifting to the use of Greek and most younger members of the community no longer speak it. The name Arvanítika and its native equivalent Arbërisht are derived from the ethnonym Arvanites, which in turn comes from the toponym Arbëna (Greek: Άρβανα), which in the Middle Ages referred to a region in what is today Albania (Babiniotis 1998). Its native equivalents (Arbërorë, Arbëreshë and others) formerly were the self-designation of Albanians in general. In the past Arvanitika had sometimes been described as "Graeco-Albanian" and the like (e.g. Furikis, 1934), although today many Arvanites consider such names offensive, as they identify nationally and ethnically as Greeks and not Albanians. Arvanitika was brought to southern Greece during the late Middle Ages by settlers from what is today Albania. Arvanitika is also closely related to Arbëresh, the dialect of Albanian in Italy, which largely goes back to Arvanite settlers from Greece. Italian Arbëresh has retained some words borrowed from Greek (for instance haristis 'thank you', from ευχαριστώ; dhrom 'road', from δρόμος; Ne'yes', from ναι, in certain villages). Italo-Arbëresh and Graeco-Arvanitika have a mutually intelligible vocabulary base, the unintelligible elements of the two dialects stem from the usage of Italian or Greek modernisms in the absence of native ones. While linguistic scholarship unanimously describes Arvanitika as a dialect of Albanian many Arvanites are reported to dislike the use of the name "Albanian" to designate it, as it carries the connotation of Albanian nationality and is thus felt to call their Greek identity into question. Sociolinguistic work has described Arvanitika within the conceptual framework of "ausbausprachen" and "abstandssprachen". In terms of "abstand" (objective difference of the linguistic systems), linguists' assessment of the degree of mutual intelligibility between Arvanitika and Standard Tosk range from fairly high to only partial (Ethnologue). The Ethnologue also mentions that mutual intelligibility may even be problematic between different subdialects within Arvanitika. 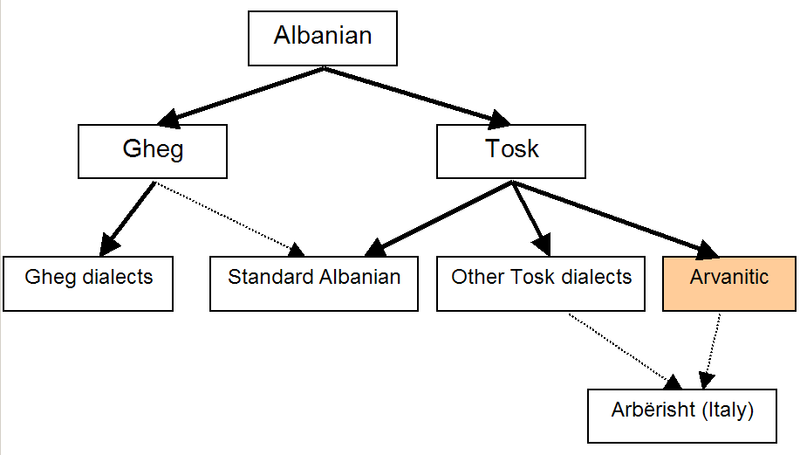 Mutual intelligibility between Standard Tosk and Arvanitika is higher than that between the two main dialect groups within Albanian, Tosk and Gheg. See below for a sample text in the three language forms. Trudgill (2004: 5) sums up that "[l]inguistically, there is no doubt that [Arvanitika] is a variety of Albanian". In terms of "ausbau" (sociolinguistic "upgrading" towards an autonomous standard language), the strongest indicator of autonomy is the existence of a separate writing system, the Greek-based Arvanitic alphabet. A very similar system was formerly in use also by other Tosk Albanian speakers between the 16th and 18th century. However, this script is very rarely used in practice today, as Arvanitika is almost exclusively a spoken language confined to the private sphere. There is also some disagreement amongst Arvanites (as with the Aromanians) as to whether the Latin alphabet should be used to write their language. Spoken Arvanitika is internally richly diversified into sub-dialects, and no further standardization towards a common (spoken or written) Standard Arvanitika has taken place. At the same time, Arvanites do not use Standard Albanian as their standard language either, as they are generally not literate in the Latin-based standard Albanian orthography, and are not reported to use spoken-language media in Standard Albanian. In this sense, then, Arvanitika is not functionally subordinated to Standard Albanian as a dachsprache ("roof language"), in the way dialects of a national language within the same country usually are. Regions of Greece with a traditional presence of languages other than Greek. The green areas represent where Arvanitika was/is spoken. There are three main groups of Arvanitic settlements in Greece. Most Arvanites live in the south of Greece, across Attica, Boeotia, the Peloponnese and some neighboring areas and islands. A second, smaller group live in the northwest of Greece, in a zone contiguous with the Albanian-speaking lands proper. A third, outlying group is found in the northeast of Greece, in a few villages in Thrace. According to some authors, the term "Arvanitika" in its proper sense applies only to the southern group  or to the southern and the Thracian groups together  i.e. to those dialects that have been separated from the core of Albanian for several centuries. The dialects in the northwest are reported to be more similar to neighbouring Tosk dialects within Albania and to the speech of the former Muslim Cham Albanians (Çamërishte), who used to live in the same region. These dialects are classified by Ethnologue as part of core Tosk Albanian, as opposed to "Arvanitika Albanian" in the narrow sense, although Ethnologue notes that the term "Arvanitika" is also often applied indiscriminately to both forms in Greece. In their own language, some groups in the north-west are reported to use the term Shqip (Albanian language) to refer to their own language as well as to that of Albanian nationals, and this has sometimes been interpreted as implying that they are ethnically Albanians. The Arvanitika of southern Greece is richly sub-divided into local dialects. Sasse (1991) distinguishes as many as eleven dialect groups within that area: West Attic, Southeast Attic, Northeast-Attic-Boeotian, West Boeotian, Central Boeotian, Northeast Peloponnesian, Northwest Peloponnesian, South Peloponnesian, West Peloponnesian, Euboean, and Andriote. Estimated numbers of speakers of Arvanitika vary widely, between 30,000 and 150,000. These figures include "terminal speakers" (Tsitsipis 1998) of the younger generation, who have only acquired an imperfect command of the language and are unlikely to pass it on to future generations. The number of villages with traditional Arvanite populations is estimated to more than 500. There are no monolingual Arvanitika-speakers, as all are today bilingual in Greek. Arvanitika is considered an endangered language due to the large-scale language shift towards Greek among the descendants of Arvanitika-speakers in recent decades. Arvanitika shares many features with the Tosk dialect spoken in Southern Albania. However, it has received a great deal of influence from Greek, mostly related to the vocabulary and the phonological system. At the same time, it is reported to have preserved some conservative features that were lost in mainstream Albanian Tosk. For example, it has preserved certain syllable-initial consonant clusters which have been simplified in Standard Albanian (cf. Arvanitika gljuhë [ˈɡljuhə] ('language/tongue'), vs. Standard Albanian gjuhë [ˈɟuhə]). In recent times, linguists have observed signs of accelerated structural convergence towards Greek and structural simplification of the language, which have been interpreted as signs of "language attrition", i.e. effects of impoverishment leading towards language death. Arvanitika has rarely been written. Reportedly (GHM 1995), it has been written in both the Greek alphabet (often with the addition of the letters b, d, e and j, or diacritics, e.g. ) and the Latin alphabet. Orthodox Tosk Albanians also used to write with a similar form of the Greek alphabet (e.g. ). Áti ýnë që jé ndë qiéjet,ushënjtëróft 'émëri ýt. Ati ynë që je në qiell,u shënjtëroftë emri yt. Ati ynë që je në qiell,shejtnue kjoftëemniyt. si në qiell,edhe mbi dhe. si në qiel lashtu në dhe. sepse e jotja është mbretëria e fuqia e lavdia në jetët të jetëvet. sepse jotja âsht mretnia e fuqia e lavdinë jetët të jetëvet. Our Father who art in heaven,hallowed be thy name. and lead us not into temptation,but deliver us from evil. For thine is the kingdom,and the power, and the glory,for ever and ever. Do you speak Arvanitika at all? How am I doing? Very well, thanks. Now she too is ok, the sickness is over. Tell your father, if he wants to go tomorrow to cut wood let him call me. Skutsch, Carl (2005). Encyclopedia of the world's minorities. Routledge. p. 138. ISBN 978-1-57958-468-9. Retrieved 3 January 2011. Nordhoff, Sebastian; Hammarström, Harald; Forkel, Robert; Haspelmath, Martin, eds. (2013). "Arvanitika Albanian". Glottolog. Leipzig: Max Planck Institute for Evolutionary Anthropology. "Arvanitika". Oxford English Dictionary (3rd ed.). Oxford University Press. September 2005. Misspelled as Arberichte in the Ethnologue report, and in some other sources based on that. E.g. Haebler (1965); Trudgill (1976/77); Sasse (1985, 1991); Breu (1990); Furikis (1934), Babiniotis (1985: 41). For detailed sociolinguistic studies of Arvanite speech communities, see Trudgill/Tzavaras 1977; Tsitsipis 1981, 1983, 1995, 1998; Banfi 1996, Botsi 2003. Trudgill 2004, citing the conceptual framework introduced by Kloss (1967). Salminen (1993) lists it as "seriously endangered" in the Unesco Red Book of Endangered Languages. (). See also Sasse (1992) and Tsitsipis (1981). Banfi, Emanuele (1994): "Minorités linguistiques en Grèce: Langues cachées, idéologie nationale, religion." ["Linguistic minorities in Greece: Hidden languages, national ideology, religion."] Paper presented at the Mercator Program Seminar at the Maison des Sciences de l’ Homme, on 6 June 1994, in Paris. Banfi, Emanuele (1996), "Minoranze linguistiche in Grecia: problemi storico- e sociolinguistici" ["Linguistic minorities in Greece: Historical and sociolinguistic problems"]. In: C. Vallini (ed. ), Minoranze e lingue minoritarie: convegno internazionale. Naples: Universitario Orientale. 89-115. Furikis, Petros (1934): "Η εν Αττική ελληνοαλβανική διάλεκτος". ["The Greek-Albanian dialect in Attica"] Αθήνα 45: 49-181. Haebler, Claus (1965): Grammatik der albanischen Mundarten von Salamis. ["Grammar of the Albanian dialects of Salamis"]. Wiesbaden: Harassowitz. Joseph, Brian D. "Comparative perspectives on the place of Arvanitika within Greece and the Greek environment", 1999, pp. 208–214 in L. Tsitsipis (ed. ), Arvanitika ke Elinika: Zitimata Poliglosikon ke Polipolitismikon Kinotiton Vol. II. Livadia: Exandas, 1999PDF. Sasse, Hans-Jürgen (1985): "Sprachkontakt und Sprachwandel: Die Gräzisierung der albanischen Mundarten Griechenlands" ["Language contact and language change: The Hellenization of the Albanian dialects of Greece"]. Papiere zur Linguistik 32(1). 37-95. Sasse, Hans-Jürgen (1991): Arvanitika: Die albanischen Sprachreste in Griechenland. ["Arvanitika: The Albanian language relics in Greece"]. Wiesbaden. Sasse, Hans-Jürgen (1992): "Theory of language death". In: M. Brenzinger (ed. ), Language death: Factual and theoretical explorations with special reference to East Africa. Berlin: Mouton de Gruyter. 7-30. Sella-Mazi, Eleni (1997): "Διγλωσσία και ολιγώτερο ομιλούμενες γλώσσες στην Ελλάδα" ["Diglossia and lesser-spoken languages in Greece"]. In: K. Tsitselikis, D. Christopoulos (eds. ), Το μειονοτικό φαινόμενο στην Ελλάδα ["The minority phenomenon in Greece"]. Athens: Ekdoseis Kritiki. 349-413. Strauss, Dietrich (1978): "Scots is not alone: Further comparative considerations". Actes du 2e Colloque de Language et de Litterature Ecossaises, Strasbourg 1978. 80-97. Trudgill, Peter (1976–77): "Creolization in reverse: reduction and simplification in the Albanian dialects of Greece", Transactions of the Philological Society, 32-50. Trudgill, Peter, George A. Tzavaras (1977): "Why Albanian-Greeks are not Albanians: Language shift in Attika and Biotia." In: H. Giles (ed. ), Language, ethnicity and intergroup relations. London: Academic Press. 171-184. Tsitsipis, Lukas (1981): Language change and language death in Albanian speech communities in Greece: A sociolinguistic study. PhD dissertation, University of Wisconsin, Madison. Tsitsipis, Lukas (1983): "Language shift among the Albanian speakers of Greece." Anthropological Linguisitcs 25(3): 288-308. Tsitsipis, Lukas (1995): "The coding of linguistic ideology in Arvanitika (Albanian): Language shift, congruent and contradictory discourse." Anthropological Linguistics 37: 541-577. Tsitsipis, Lukas (1998a): Αρβανίτικα και Ελληνικά: Ζητήματα πολυγλωσσικών και πολυπολιτισμικών κοινοτήτων. ["Arvanitika and Greek: Issues of multilingual and multicultural communities"]. Vol. 1. Livadeia. "Musings of a Terminal Speaker" - an article by Peter Constantine in Words Without Borders.